If ever there was a recipe for my sister, or the ladies, this just might be it. The bonus is that it's dead simple and you really don't have to "cook" for this one. You need a blender, a microwave or sauce pan, and a ready made graham cracker pie crust. 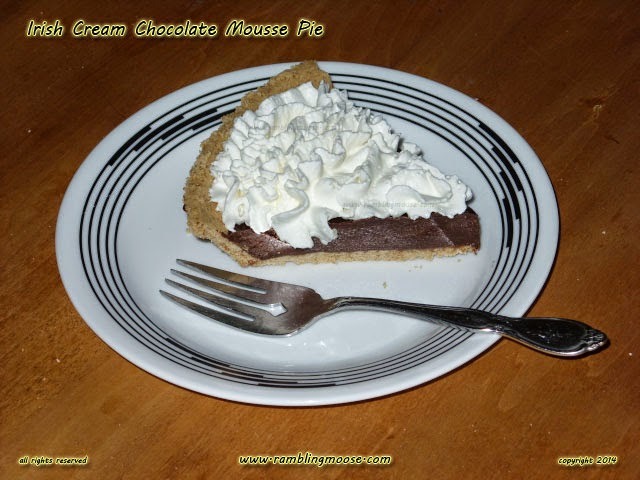 The chocolate crumb pie crusts would be good as well for a change of pace to maximize your chocolate cravings. If you don't like the idea of Irish Cream and the alcohol, or just want to make it a lighter dessert, you can swap in some 2% milk. If you do use Irish Cream, the recipe is a bit too strong if you don't split the Irish Cream with Milk. My suggestion is that you make the recipe with 3 ounces Irish Cream, 3 ounces of Milk for a balance of flavor. This recipe really is simple - someone who swears that they can't cook, or won't cook, or the kitchen makes them break out in hives would be able to make this. In fact, if you are looking for a bonding experience with your child and want something safe to make, this recipe could be it. Just leave out the alcohol in that case since they will want to lick the spoon! 6 ounces of good chocolate broken in to small chips. The better the chocolate, the better this will be. Set out your pie shell. Add to blender Chocolate, Egg, Vanilla, Grand Marnier or Rum, sugar, and salt. Pulse blender until it has been well mixed. Warm the Irish Cream and milk until it not quite boiling. This can be done in the microwave without fear of scorching. About 180F would be the correct temperature since the object is to get it hot enough to melt the chocolate. Pour Irish Cream mixture into the blender and blend until smooth. This will take about a minute or so. The more air you pump into the mix, the more light and fluffy your pie will be. Pour the chocolate into the pie shell and chill for at least an hour. The better the chocolate, the better your results! I have made this recipe with Chocolate chips, some chocolate bars that were sent to me by my sister, and a mix of chocolates I have had around the house. All were good, some were better than others! This recipe could also work well with butterscotch chips if you want something completely different.